From the forthcoming ‘Prepare For Lift Off’ EP platform, Denver’s Manufactured Superstars are about to put another four slabs of electronic dance music into the stratosphere. Stage 1 of the upcoming ‘Prepare For Lift Off EP’ achieves primary ignition with ‘Like Satellites’. Twining its vocal appeal is North Hollywood-based singer/songwriter Danni Rouge. Having previously top-lined the tracks of Rusko and others, she brings the same accessible catch to the lyrics and moving tones to its vocals. With the Superstars’ chunky drum and percussion loops and synths manufacturing an electrifying storm in the break, at the top of the drop ‘Satellites’ is hurled clean into orbit. 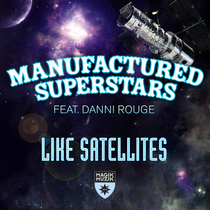 Further into September, Manufactured Superstars will be premiering more of the EP’s tracks. Come the end of the month the Prepare For Lift Off Tour will launch, taking in dates around the States beyond.